On the fence about DNA testing? James Schramko and Jonny Deacon offer compelling arguments for its value in Part 2 of the Optimum Strategy To Health And Fitness Series. In this episode, they talk about nutrition tailored to your genes and the role of psychology in building an effective fitness plan. 03:43 – Should you bother getting fit? 06:52 – Is it the best diet for you? 17:27 – How sensitive are you to carbs? 1:13:27 – How much vitamin B do you need? 1:46:49 – What determines gluten tolerance? James: James Schramko here. Welcome back to SuperFastBusiness.com. We are knee-deep in a journey into DNA fitness. We’re in The Optimum Strategy to Health and Fitness Series with Jonny Deacon, and this is part two. To do part two, I need Jonny Deacon. Are you there mate? Jonny: How are you James? James: I’m actually, really good. Thanks in large part to my little, small army of health supporters who seem to be band together to work on me, the person, the body, to get me more flexible, to get me stronger, and fitter, and healthier. You’ve been a big part of that lately, Jonny. In our first episode, which if you haven’t listened to, go back and listen to. Our part one was about why are we looking at this whole DNA thing. What is the connection to understanding ourselves with our fitness and what we eat? Why is that so important? So go back and listen to that episode if you haven’t listened to it. This episode, we’re going to be revealing my diet report. So if you’ve been following along, in the previous episode, we were talking about my fitness report and what the DNA of my core structure is. We also talked about why a lot of health and fitness programs don’t work and where DNA is going and how useful that is. We’re also going to get into the mindset, the psychology of how we incorporate this fitness stuff. We’re going to talk about Kolbe in this episode. So we’re buckling in for an interesting ride. In fact, in episode three of this series, we’re going to be having a look at the three pillars of how you can have a great lifetime habit. I’m very excited about everything that’s coming. There’s been some developments too, Jonny, even since we last spoke. Jonny: Yes James. I’m really excited to hear all the feedback. Certainly from my end, people have been very generous in relation to some of the feedback we’ve been given, and it’s just been a fantastic platform to help educate and really provide value to your listeners. If you’re trying to get in touch with Jonny, head over to mydnacoach.com, and you’ll be able to find Jonny Deacon, if you’re interested in what we’re talking about. So that’s how you get in touch. But they’re riveted to the series. I am aware this is a business podcast. We were just talking about why is it important to be healthy and fit. Actually, one of our members, Ash, he said, “Why are you so interested in this fitness? We’re all going to die. Why bother?” And I said, “Well, I actually want to be able to surf longer. I want to be able to do better maneuvers. I want to be around to see my grandkids.” I don’t have any yet, but I do have four kids. So there’s a good chance that I’ll have grandkids. I think that if you’re going to be living, why not be in good shape and avoid illness and terrible diseases if you’ve got the choice. That’s why I want to know. So that was interesting. I’m not sure if you’ve had anyone ever challenge you, like Jonny, why do you bother working out? You’re going to die anyway. Have you ever had that? Jonny: It’s interesting when you talk about examples like that James, because being on a business-focused podcast and the incredible things you’re doing with your community, when we talk about this in relation to the internet marketing space or the business world, when I start to say things like improved concentration, sharper memory, faster learning, prolonged mental stamina, enhanced creativity, lower stress levels, more profitable business, people start to think, ah right, maybe this could possibly be an investment in my business. I think it’s about framing. If you’re a business owner, or you’re an entrepreneur, or you’re someone that really wants to do and perform better at work, I think from my experience with clients in using this technology and part of our process, when you start framing it as an investment in your business and it becomes part of the protocol, some wonderful things can happen. So I definitely think that that comes down to how you market your process, but also, really looking at it from those lenses, it can really frame it much better for people. James: Yeah, and I want to point out, I think Ash was tongue in cheek, but he was just interested in why I’m interested in it. And I’m very interested in it. And I’m not saying we should get our body good so that we can work 16-hour days. I’m absolutely not saying that. I’m saying, as a result of the things that I’ve been doing and you’ve been part of this journey, I’ve joined a gym for the first time in 20-something years, I’m surfing pretty much every day, when I am working, I’m really working well. I’ve got great concentration and I’m doing good work. There’s a difference between being busy, which is like noise, or doing good work, which is signal. When I’m coaching people, I’m really using my brain, and I’m putting myself in that. I’ve got better posture at my desk. I’m focused, and I’m present in that moment. So everything’s really coming together. I’m very interested to find out what I should be eating because that’s a big part of it. I know one part of it is moving and doing the exercises, but we have to fuel our body. I can imagine there’s a big difference about what we put into our body, and there’s certainly enormous industry around that whole notion. I’m just wondering how important is it to match what we’re eating to our body type according to the DNA report? If we were to listen to online gurus, or so-called experts, then we’re led to believe that it’s actually really, really difficult with lots of different turnkey solutions and lots of different formulas within the health and fitness space. But actually what you get is a multitude of results that can tell you to avoid carbohydrates completely, or others will tell you to focus on meat and vegetables or avoid dairy, you even open up and go down the newsagents and see various different magazines with different celebrities with beach-bodies ready and saying, “eat great fruits for the next six weeks, and you’ll have the perfect body, and feel the best you ever have.” Even in the more scientific aspects of this, you’ll see people preaching the paleo lifestyle. Eat exactly like our ancestors did. James: [laughs] I laugh, because how the hell did they know what our ancestors ate? We could only assume it was anything and everything they could grab that didn’t move fast enough for them to capture. Jonny: Right. Exactly. And you know, the extension of this is, the craze nowadays is drinking coffee just until like one or two in the afternoon, and you know, go on a very intermittent fasting strategy. And the thing is, James, all of these diets have their proponents, but all of them are certain that their diet is the best and the most effective. One of the key things that I get asked a lot by clients is what about reducing body fat, which is a key component to optimizing internal health along with various other protocols within the health and nutrition aspects of this? They ask questions like, “Should we consume saturated fats to build muscle and lose fat?” Or, “Are they going to cause heart disease?” And most people these days fall into two very firm counts, which recently is that carbohydrates are bad, and that saturated fats and fats are good. The thing is, people may read a blog post by a nutritionist they might like or respect, or perhaps they’ve taken advice from friends, families, or other professionals. But here’s the thing, how do you know that that information that you get from these sources is best for you? And the answer is, you don’t. There’s just so much information, and diet fads will come and go, depending on the latest trend. The thing is James, this leads to a lot of confusion. If you’re on some type of diet, for listeners who are on some type of diet at the moment, how do you actually know which diet is actually best for you? If you are on a diet, should you be sticking to that, or should you be changing to the latest one? One of the things that I find with clients that come and see me is that we know generally that motivation is incredibly challenging in all aspects of life, let alone sticking to a diet. Many people that come into this world within the health and fitness space want early success. And if they don’t get it, then it’s very likely that they’re going to exit the industry pretty quickly. So in fact, what all of the advice does is actually tell you what works in theory or in practice for a certain number of people and actually doesn’t look at you as an individual. When you consider one of the keys to “successful diet” is consistency, you can see how these problems start to occur. James: Yeah. I can imagine that a lot of this instant gratification is placed there by marketers themselves. Jonny: Totally. Here’s the truth James, most nutrition research and diet information doesn’t look at what actually makes you who you are, which is our genes. As we talked about in the first part of this series, we’re all different, especially on the inside, and inherently, most people know this is true, but they don’t have the strategy. So I’m big on this. You know where I’ll be moving with this with technology from the first part of this series. I’m a huge adapter and believer instead of applying broad dietary principles to everyone, which is start using your genes now to match you to a diet that suits your genetic makeup. I believe the best type of diet is one that you can actually stick to. It doesn’t matter how good the diet is, if you can’t continue it day in and day out, then you just won’t see results. And a “diet” must become a lifestyle, and it must become effortless. James: I like that. I do like that. I first picked up ideas around that from a guy called Dr. John Dickel; he’s got a great Australian diet. He had some really basic things, like he likes low HI food, low human interference. In other words, if it comes in a packet, it’s probably not as good for you as if it’s come in its natural form. So like a packet of crisps is not going to be as good as an apple. Natural packaging is a good indicator, less human interference. He also talked about; you’ve got to have something that you can sustain. Anything that requires too much of something or not having anything could be a warning sign that you are starting to get onto something unsustainable. Jonny: Absolutely. And fortunately, there’s evidence that a genetically-matched diet increases diet adherence and also increases fat loss compared to standard weight loss diets. Jonny: Yeah. This can be very powerful, James. To give you a little bit digging here, a little bit more granular, a 2007 study published in a nutrition journal, examined the effects of having a genetically-matched diet compared to just a standard diet in a group of weight-loss patients. One of the things they found is that early on, when motivation was really high, there wasn’t any difference between the groups in terms of fat loss. But after 100 days, the genetically-matched diet continued to lose weight, whereas those on the standard diet regained some of that weight they’d lost. Here’s the thing, after a year of follow up, those on the genetically-matched diet had still lost weight, whilst those on the standard diet had actually gained. So the reason I like using this example, an incredible example to pull people away from this guessing game, is that I really feel now it’s time with this revolution coming that this one-size-fits-all approach is put to bed, and it really is time to start following a diet, a nutrition plan that best suits your genes. And I like the example you used there because you’re right, common sense does apply at the moment for those that really just want something that will almost pull them over the line, but we just don’t know how efficient that is for an individual, and we don’t know how long it will take that individual. And as we said from the first part of this series, you can absolutely get results from doing exercise and applying common sense to your nutrition. But I’m sure your listeners would agree, we want to be optimized. Just like business owners and entrepreneurs want to be optimized, you want to get the best result you can for the least amount of effort. Certainly the clients that I speak to want to do that because they’re already busy as it is. James: Yeah. And I think it’s great. We’re around the concept, hey, I want to eat well, and I want to match it to my type. I’m there. Who’s going to disagree with that? I heard a great story about, I think it was Joe Polish talking to a brain doctor, and he said, “If we were a performance racing horse, if we owned a performance racing horse, we wouldn’t feed it a packet of chips. You’d give it high-quality food.” But then we’ll go and stuff a packet of chips in our face, or drink a Coca-Cola, or whatever. I don’t know if I can say Coca-Cola. I guess I can, it’s my own show, right? We can drink a cola. But why is it we know this, but we still do bad things anyway? Our body is probably craving carbohydrates or sugars, because it thinks we’re stuck in the middle of nowhere, and we come across a bush of berries, and we want to just eat as many as we can because it could be days before we get fed, because our body is programmed with like, I read this in Sapiens, we’re programmed for a couple of hundred thousand years, and we haven’t really caught up to the way that things work now. Our body is a slow learner. So these things happen around us faster, and we’ve replaced food with pretend food, and it’s triggering these desires. But wouldn’t it be good to know what the hot buttons are or not in your own body? Which things set you off? Which things are good for you? I want to know. And I believe you can tell me. Jonny: Absolutely. And it brings us on really nicely as a segue into the first markers on your nutrition report. I think listeners will be really invested in this. If they’ve had challenges with weight loss in the past or issues with their nutrition, the first mark on this is we look at your carb and fat sensitivities. Now just to give some context to this, all diets are made up of something called macronutrients of which there are three, four if you include alcohol. These are pretty well known. They’re fats, carbohydrates, and proteins. Now what we know is, is that our genes impact how well we tolerate both fats, especially saturated fats and carbohydrates, which are the main sources of energy in our diet. Now if you don’t tolerate carbohydrates quite as well, James, there are strategies to be able to work around that. Similar to our genes indicating high intakes of saturated fat in theory could increase the risk of obesity cardiovascular depending on your genes. It might be worthwhile for some people consuming less of them. So we all know someone, I love this example, that can stuff their face with carbohydrates and not gain weight, but we also know people that can just look at a sweet potato and actually become one. So the question I ask is, how on earth can the same approach work for everyone? We do need a better way and an individualized way, and fortunately for you, you’re now removing yourself from that one-size-fits-all bucket. So let’s talk about what carb sensitivity actually means. Well effectively it means what does a carb mean to you as the individual. So what we talk about here, the example is the amount of energy that one calorie of carbs can give you, James. And that can change based on your genetics. So in theory, people are going around with the assumption that if you and I were to eat exactly the same sweet potato, that we would be able to simulate that, to metabolize that, to be able to break that down and draw energy from that in exactly the same way is not just true. It comes back to the first part of this series when we talked about being different on the inside. How we actually assimilate food and draw energy from it varies from person to person. So as we’ve said, amazing we’re told one calorie equals a calorie, but actually, this is very different from every single person. It’s only been up until now that we’ve had the technology that’s viable enough to assess everyone with this. So are you ready for your carbohydrate-sensitivity result? James: Nah, we’ll get to it later. Of course I am. I’m like, I’m desperately keen to find out. This has been a process of weeks, actually months since we first spoke. So it’s like, this is a big reveal. I’m bracing myself. I’m ready. Jonny: It is worth noting actually, just a very quick side note that we have been corresponding for a while, but the actual test itself, if people are looking to do a test, on average, they can look between three to four weeks to wait for the test. So it hasn’t obviously been months, because actually some tests in companies can take up to eight weeks, which I think is a bit extreme. So ideally, if someone’s looking for a test, three to four weeks is normally the average depending on where you are in most countries. James: And we did get a comment on the first episode, it was what test are you recommending at the moment? James: Someone asked on the first episode in the comments section, where do they get this test? Which one do you recommend right now? Jonny: Yeah. As I said in part one, we’ve been testing a huge volume of different tests in companies and actually the testing company we use is called DNAFit. We believe that they have the highest quality algorithm, they’re only one of the few that have a quality algorithm. And also in terms of the quality of reports and their ease. And that’s why we are really looking in partnering with them because it’s been a much higher quality test than any others that are currently in the market for us and for the purpose of the way that we want to work with clients. It really is important as we go through the rest of this series to understand that DNA is incredibly important, but it certainly is just one part of this process. So it’s worth starting off with quality and going through the entire process with quality. But to come back to your carbohydrate marker, you actually came back, and the scales of the same for some of the markers that we spoke about in your fitness report going from very low to very high, you came back high, actually medium high to carbohydrates sensitivity. This isn’t good or bad. In fact, it’s incredibly fascinating for someone that is from a training perspective with you and working with you as a coach. The reason I say that is there’s certain genes in here, which I’d like to pull out for the listeners, remember we used an algorithm here where there’s multiple genes that in relation to that score, which give us a result for you, what that means is that the way that you’ll deal with that sweet potato will be slightly different to where I am. Where I actually come in, I’m at low sensitivity to carbohydrate. Now for you, there’s one gene in particular, I want you to pick out here for relevance of the audience, and that’s a gene which is called TCFL72, and that interacts with carbohydrate intake to determine type 2 diabetes risk, which is brought on by a very poor diet of highly-processed, refined carbohydrates. Think sugary doughnuts, starchy foods, like that. Now we’re on a high glycemic low diet, which is a measure of which takes into account the amount of carbohydrates in a portion of food together, with together of how quickly it raises blood glucose levels. Certain people’s gene markers will have a higher risk of bringing on type 2 diabetes than others. What we’re saying is, look, you’re at higher risk, and we wouldn’t know that without doing this test. So for people that are questioning whether you should do a blueprint or not for your health, the first thing is, I would always advise anyone to try and get healthy, but let’s just look under the hood. Because otherwise, we’re just not going to know this without checking this data. James: Right. That’s one of the questions people ask me. What if it comes back bad? What I’m hearing here is that if you had a particular type of gene, and if you were particularly interested in sugary doughnuts, you could be accelerating your demise. You’re just like pushing the limit in terms of brinkmanship. You might just overstep your bounds if you’re triggering a time bomb. Jonny: Absolutely James. And we know that there’s a higher proportion of TT genotypes within the Middle East and within Asia. With that high proportion of those people of those genes, and without doing a test like this, with western foods moving in within these regions and becoming ever increasingly more popular since the 60’s and 70’s, the sugary and refined foods in cultures in this genetic hotpot, which we spoke about in the first series, where are people are putting food sources in where genetically, they just don’t have the capability like others to deal with them. So they’re at much higher exposure and risk to certain foods that they’re putting in their mouths, and they’re unaware of it. When you start getting granular with this especially on the neutrogenic side and neutrogenomics, when you look at this, it really is important for people to start at looking a blueprint of their self as an individual, and they can start lowering these risks, because remember, anyone that’s really interested in discovering their DNA is doing this for a long-term approach. We know in the business world that short-term solutions really don’t work, if ever work. So those that are looking for long-term approach, putting this in place over a certain period of time means that when people get towards their 50’s, their 60’s, and their 70’s, their risks have already been reduced significantly. James: So, just back to the really important stuff here, in terms of my carbohydrate marker, you’re saying that I got a medium to high rating on that, and I don’t have as much risk of the diabetes. But what does it actually mean with the medium high? Does that mean that a little bit of carbs goes a long way with me? Jonny: What’s interesting here if we dig in a little bit more, so what pushed it up to that medium high was a gene called PPARG. This is in relation to insulin sensitivity. How this works is people are more sensitive to the negative effects of refined carbs with this gene if they lead a sedentary lifestyle. So we know from your genetic report in particular with this gene that a sedentary lifestyle, which is the type of lifestyle where there’s no or irregular physical activity and colloquially, people will know this is the couch potato, the interesting thing for discussion here James is that you started a path of introducing something in the form of exercise through surfing on a daily basis for what I believe is a number of years now. So you’re actually putting in a lifestyle change, which we spoke about at the first part of this series, which is actually dampening down and not allowing the expression of this PPARG gene. And that’s when you start getting granular of this. It gets incredibly fascinating. So well done on that already. That’s a really good thing that you’ve done already by implementing that. James: Well just out of curiosity, does having a medium or high thing, has that got any link at all to cravings, you know, like sugar cravings or sweet tooth, that sort of stuff? Jonny: Yeah for sure. And that actually comes on to another gene, which we’ll speak about in the next panel in relation to fat sensitivity, which is the FTO gene. And if you type in the FTO gene to Google, it will come up with almost like the fat gene. Now there are certain genes, which will intercept things, which are called hormone releases, which are called ghrelin and leptin, which are hunger hormones, they’re stimulants within males and females. So depending on that gene amongst others, they can dictate when people either, right, I’ve had my meal now, the hormone is produced, I need to stop eating. So some people will have a much slower release of that or it won’t release as fast. So people will keep eating and not have that hormone released to be able to signal to you, I need to stop eating. And the other hormone will control, actually, I’m more and more hungry. I need to keep grazing. And that comes back to when you spoke about that book in Sapiens, where these triggers were implemented because there will be times for 24 hours, 48 hours, even more, where people, when they had food in front of them, they needed to consume as much as possible, and they would then have to wait for periods of time when they wouldn’t have the next meal. That’s where it comes back to these very sort of different things going on with things like you’re talking about with sugary foods and “bad foods.” But that’s why people can’t stop grazing and eating these foods, because they’re just hormonally built from 200,000 years of evolution to consume everything just in case it’s not there. James: I’ve often felt that what you’re talking about could apply to me. I felt like I have a slightly pot belly and that I don’t stop eating. Even after a meal, I can eat more. And I do feel as though I have a sweet tooth, where I will be interested in having something sugary, and I’m fully aware, I’ve watched that sugar movie, and I’m fully aware of what a poison it is, and how it is more addictive than cocaine or something like that, I can’t remember specifically, but I do feel like I want to have something sweet sometimes, like I like to put a banana in my protein shake if I’m going to do an activity or whatever, or I want to eat an apple. I feel like some sugar. So the medium high carbohydrate thing, and by the way, my absolute favorite meal ever is like a pasta, like a pasta with a red sauce. It’s like, if my body is sick or I have a cold, I just want to put garlic, and chili, and have a pasta, and I can feel it going through my body like a thermonuclear reactor. I can feel the carb rush in my body when I eat that. Is that weird? Jonny: No, not at all. What’s going to be interesting is when we come onto your celiac predisposition, your risks within and around gluten, because there are some exposures there. If you’re heavy on that kind of thing with pastas and breads, it will be an interesting conversation to wrap up this nutrition report, because I’ve got some interesting insights for you. James: Well I’m not heavy on it now, and especially late at night, but the interesting thing is I truly feel that, I’m aware of sensations when I eat those foods. I can tell. In fact, I will start sneezing if I eat some things as well. So I’m becoming tuned into how the food reacts to my body and what you’re talking about here is very interesting. So far we’ve ticked off the carbohydrate marker that a little bit of carb can have a bigger impact on me than you. Is that what I’m hearing? Jonny: Absolutely, yeah. And this is a strategy that’s incredibly effective, which I’m going to come onto once we’ve talked about the fat sensitivity marker, because the way that the testing company that we use work is they provide almost like a very basic nutrition plan for you based on these two markers. But it becomes incredibly more sophisticated once the other markers are included. And what we do is then we take this and we actually start to get very detailed in terms of working bespokely with you in terms of your macronutrient breakdown and also that flexible nutrition side of things, which we’ll come on to speak about. But in terms of the fat sensitivity marker, what was interesting here is, before I reveal your result, to give you some context, there’s two types of fat. There’s unsaturated and unsaturated. Fats that are solid at room temperature have a higher amount of saturated fats within them. These are things such as animal fat. And an excess of saturated fats in our diet, it really does lead towards raising cholesterol levels in the blood. So it’s often recommended by physicians that we monitor these levels as part of a healthy lifestyle. Now scientific research clearly indicates that genetics play a role in the transportation and metabolism of fat that we take in as part of our daily eating. So as a resultant effect to this, key health factors that we talk about a lot especially in the media are cholesterol levels. These get a lot of press. So when we look at these two markers on the report, we look at them in association with saturated fat. Firstly, we look at how your body reacts to saturated fat in regards to weight management, which really does a lot of people get very, very curious about this. And also, secondly, how saturated fat intake affects your overall general health in regards to cholesterol, which we talked about. Your overall mark came back from that very low to very high as low for fat sensitivity. Now this has some knock-on effects in relation to how I’ll structure your nutrition plan going forward, which we’ll speak about in a second, that optimal nutrition plan for you. But as we mentioned within the carbohydrate-sensitivity marker, one of the main genes with regards to saturated fat is this FTO gene. People with this TT genotype of this FTO gene can tolerate saturated fats really, really well. As such, generally stick to current guidelines, which on the nutritional plans that you’re given with in your DNA results, these have them on there, these recommended daily allowances. However, those with the AT and AA genotypes carry an increased risk of fat gain with higher intakes of saturated fats, which is a risk, which isn’t present at lower intake. So the key takeaway here is the next statistics that I’m going to give you. In 2009, a study was seen that AA genotypes were three times more likely to become obese on a low carbohydrate diet than the TT genotypes. So what we’re showing here really nicely is that the media in terms of a low carbohydrate diet, the absolute mass amount of people within the celebrity world and the media that love low carbohydrate diets. In fact, high-fat diets, which is what these are, are not appropriate for everyone. So these ketogenic based diets where there’s very, very low carbs and very, very high fats, especially when you consider that almost 20 percent of people have this AA genotype. So people are actually walking around in this trend-led low carb diet base. But for some of you and listeners, it’s actually killing any chance of you actually getting anywhere from a weight management perspective with your goals. So I really find that this evidence around looking at the genes, looking at what nature they have for you as an individual and looking at the studies and research that we’re starting to come from this context, it really rests and puts to bed people being obsessed with what’s led in the media. James: So I’m just curious to understand this. What you’re saying is that if you had a low carbohydrate sensitivity and a high fat sensitivity, is that the person who’s not getting any benefit from a high fat low carb diet? Jonny: Yeah, good question. So for the FTO gene, which really is the main marker on this fat sensitivity in relation to weight management marker, so for that fat marker, that fat sensitivity marker where you’re low, you actually came back an AT minor, which basically means that the TT genotype is the one that actually works really, really well with fats, and the AA genotype is the one where people that are on high levels of fats have much increased issues with almost three times more likely to become obese on a low carb diet, high fat diet. So in very bottom line terms, you’re in a very medium to low risk of that with that G marker. James: So is what I said right or wrong? Jonny: Yeah, it is, to some extent. And that’s why we use the algorithm to be able to work that out neatly for clients. So in relation to you moving forward, with you having good quality fats in your diet, and when we talk about those, we look at things like avocados, we look at things like Brazilian nuts, cashew nuts, fresh fish with salmon. Jonny: Yes. Yeah. All of these things are going to be incredibly useful for you from a variety of different reasons knowing this mark. James: So just, without preempting my caffeine sensitivity, things like bulletproof coffee could actually have a significant impact on me from what I’m hearing, because they’re low in carbs and high in fat. Jonny: Yes absolutely. But we’ll come on to the individual genes of your caffeine markers, which are also very interesting. James: I’m very interested in that because you know I love my caffeine. Jonny: Absolutely. But just to clear this up for listeners, because I want to make it as clear as possible, because as we spoke before the show, when you start to get into these panels within DNA, it can become very, very granular. And for the implementers and the quick starters that we spoke about that are kind of more inclined to just get the bottom lines, what we’re saying here is with that scale of very low to very high is that you’re that someone that can deal with more saturated fat, and you’re going to, in that respect, see less problems in terms of putting on weight with having fats in your body. What we know is that from those genes I’ve expressed with the FTO gene that actually having good quality fats for you, you’re going to feel fuller, you’re going to feel more salite, you’re going to have more energy, and you’re going to draw better energy from those fat sources for longer sustained periods of time. So rather than constantly saying, James, we’re going to put you on lots and lots of carbs to be able to have lots of energy for your gym sessions or your surf session, actually what I’d like to start doing with you is introducing good quality protein in the morning in the form of meat to be able to have slow release of insulin in the morning and good quality levels of energy, and also include good quality fats before you getting up in the morning. So I’m not sure what your morning rituals look like at the moment, because I haven’t had the chance to talk about that, but when you start getting granular with this, it can have a real effect on people’s energy levels for the rest of the day. James: Well yeah, that’s a great question. My morning ritual, just because I’ve been talking to people like the Chaperons, and we had the previous series on that, is a glass of water with a little bit of sea salt and squeeze of lemon. That seems to get my body woken up. And then I have some bulletproof type coffee. Some coffee, some unsalted butter, and some MCT oil blended. And then if I’m going to go do an activity or something, I’ll have some just one scoop of protein powder blended with water. That’s usually how I’ll start out. But I might have bacon and eggs; sometimes I’ll have some oats and a squeeze of honey with some protein powder and almond milk. I know I don’t have a terrible diet, and it’s probably not amazing, but I’ve certainly, just to sort of tie back to something you said before, before I started surfing, so like three years ago, at my peak of worst case scenario of not moving around that much and not being too happy, I’d got up to about 109 kilograms, and it wasn’t all muscle, if you know what I mean. Within six months of started surfing, I dropped down to 91 kilos, and now I’m back to around 96, and a good chunk of that has been a transition from fat to muscle. So I definitely got a stronger upper body and muscles in my stomach even though they’re slightly hidden by a layer of chub. And my arms and my general fitness, like my pulse is much lower. I can hold my breath for much longer. My endurance is significantly better than it’s ever been. But even in the last few weeks, I’m having massive gains in flexibility. Through the work I’ve been doing with Tamas, I really got to acknowledge that he’s given me exercises to help my mobility. And through going to the gym, in the course of us going through these DNA tests and being prepared for this series, I started to do my general warm up. But I can tell you, within a week or so at the gym, I know more about this than my instructor, and that’s not being cocky. It’s just that you’ve armed me with great information. I was in the gym yesterday and I bumped into our mate Ted. He said, “How’s it going?” And I said, “Great.” And he goes, “How many times have you been in?” I said, “Well, I’m coming in three days a week because I need at least 48 hours to recover from my exercise, according to my genetics. And I’m focusing on that 10 to 12 reps. Not too low, not too high, because I’ve got a medium endurance and a medium strength, according to my markers. And I’m working on the rowing and the steps just to warm up and to get my VO2 kicking along. I’m also being very careful with my technique. I’m using the machine in the most precise way possible because I have a high risk of injury with my ligaments.” And he’s just looking at me like, what? He just paused and I said, look, and I lifted my shirt and said, “Look, I’m even starting to see abs now, and my body is responding very quickly to this, combined with a good diet as well.” I said, “How’s your belly going?” He got a bit of embarrassed about that, I think. But he said, “Where do you find out about this? What’s the source? How do you know this stuff?” And I just said, “Well Ted, it just doesn’t make sense we’d have a one-size-fits-all thing. I like the charts on the wall on that, but it’s kind of hasn’t really changed in the 20 years since I’ve been in the gym. So I found a few experts who know about DNA. We can do a test these days, and it tells us what we’re working with. And then we tune our program around that.” He thought this was the greatest thing ever. I’m pretty sure it won’t be long until Ted’s listening to this podcast, because at some point, I probably have to reveal where he can go and get the information. So hello Ted if you’re listening. I love you mate. You’re awesome. But isn’t it wonderful to just have this knowledge when the rest of the world is completely oblivious to it? And also, I feel like I’m getting significantly faster results because of the people in my life. The Chaperons, Tamas, Angelo, and you. Those four pillars have brought me up to speed very quickly, and I’m seeing the results. So I am actually seeing fast results. So this diet thing is just going to take it to the next level. Jonny: Absolutely. And I’m pleased that you are mentioning Ted because he seems like most of the trainers that I come across. Remember James, I definitely don’t claim to have all of the answers, but one of my passions is being able to help bring people into the revolution and open their eyes up to other possibilities. I know we’re speaking off air of other influences that have really helped you, and it’s just wonderful because not one person has all the answers, even though I’m specializing within the genetics realm and I’m passionate about that, I’m aware there’s other influences and other markers, and that’s why it’s so important to take on lots of different ideas and approaches. But Ted seems to symbolize what most of the challenges that I came across when I was working my way up within the commercial gyms. There’s a nice blend of arrogance and ignorance, and I do believe that most personal trainers have good in them. But they can be brainwashed by the quick opportunity to make bit of cash and not really dig into their own education. James: Well I think in Ted’s situation, he doesn’t strike me at all as a cash machine. He’s obviously just following the process of the store. He’s got a lot of good in him. He’s very interested, he was animated about it, he wants to know more. So he’s a good guy. If he finds this stuff, he’s going to be significantly more useful in his role with anyone he works with. It’s just like it’s great to see this reveal. But he was genuinely shocked at my level of awareness. Just to put this in perspective, we’re in week two or three of the gym so far, so this is early days. But I’m feeling great. My body is remembering what it was like to have the pressure on it and the blood pushing through the muscles and those last few reps are exciting. Jonny: I’m incredibly excited for you James. And it brings us neatly onto the second part of that fat-sensitivity marker, which is how you deal with saturated fats from an internal health point of view. What we mean by that is that fat provides us with a concentrated form of energy. So they supply essential fatty acids to the body, which it can’t produce, and it helps the body store energy and insulate tissues along with absorbing fat-soluble vitamins and hormones. But saturated fats can raise LDL levels, which are low-density lipoproteins. What that means is that cholesterol levels can actually start to increase and be linked to cardiovascular disease. So the main gene in the second part of this fat sensitivity marker is called FABP2, which is a fatty acid binding protein. What this does effectively without oversimplifying it is depending on your genes, you’re either really, really good at pulling in saturated fat into your bloodstream from your intestines, or you’re kind of OK, or you’re really, really bad. And there’s three version of this gene, which come in the forms of a GG, and AG, or an AA allele. The GG version is the inefficient version. So it’s not good at grabbing that fat and pulling it into the bloodstream from the gut, which is actually very, very bad for people. And for you, if that FABP2 gene, you’re a GA, so you’re OK, you’re moderately somewhere in the middle of doing that function. That’s the reason that it actually didn’t come in on the scale of very low. Now there’s other markers and other genes are playing a role within the algorithm of that scale but the take-home message for listeners here is that in building your optimum nutritional plan, which we spoke about off air on the first part of the show, we now have food columns for you across carbohydrates, proteins, fats, including green veg, colorful veg, and fruit, along with seasonings, including herbs. Where we would take this information is categorized for you within these different sources and we’ll just use the main three here because they’re the easiest to understand with, carbs, proteins, and fats. I now know what foods to be able to be delivering with you on this nutrition plan and it’s a flexible approach that you can take these and create meals. When you’re at the supermarket and you said after a surf you’re tired, these lists will already be synched for you so that you can actually just go, right, I know this is matched to my genes. I know I’m going to be hitting my markers in relation to what I do from a weight management point of view and a performance point of view. I can move forward and it’s easy. And that’s really where this starts to take off and become revolutionary because before, we’re still just going in there and behaving as like everyone else. James: Right. So you’re saying that I could choose, say I come back from a surf, I’m really hungry, it’s lunch time, I could choose between making a pasta with a tomato sauce or hooking into 250 grams of Atlantic salmon or something. Jonny: Absolutely. That’s a really good example. And we know now from your markers that yes, you can get away with having carb sources in your diet absolutely, and we’re not saying that carbs are bad for you. You definitely need them. They’re essential for you, not just from an energy perspective, but also if you’re going to the gym, or you’re doing a sports activity, you absolutely need carbohydrates along with protein to be able to put on good quality lean muscle. But what we’re saying is that we know that fat sources work incredibly well for you. From a weight management point of view, you’re going to be swimming upstream a little bit if you’re constantly going hard on the carbs compared to actually utilizing a fat source. And the big point here is this is bespoke to you. Not looking at other individuals. James: Yeah. We’re only talking about me. Disclaimer, disclaimer, blah, blah, blah. See a doctor. So basically if I was a food DJ, I’m just spinning some dishes a little more than the others to get an advantage. Jonny: Totally. And it’s incredibly empowering when you actually start to work at this from a flexible approach, which we’re going to speak about more in this series, and really stop getting people thinking about a structured template diet that the Teds of this world would have people go on because it’s worked for most or some of their clients. So what we’ve covered there is looking at two aspects of that fat-sensitivity marker. You came in low overall. And we looked at the first part of that, which is in relation to weight management, which you came back at medium, and then what brought it down to low was this OK ability to be able to, from a fat saturated perspective, being able to bring fats into the bloodstream. You’re OK at that. So on that marker, in terms of internal health, the second part of that fat-sensitivity marker; you came in medium to low. So some really interesting results from the fat-sensitivity point of view and it really help a coach or someone who knows what they’re talking about with this. They’re able to build a nutritional plan including these rather than giving you a template. James: This might be a dumb question but where do things like protein sit? We’ve been talking about carbohydrates and fats. Now, I already know for me when I’m choosing a source of protein, I’m avoiding ones that have sugars and carbohydrates. I don’t want a muscle bulker. I choose one that have low carbohydrates and some of them have some fat but not much. But where’s the protein in all of this? Jonny: Yes. So in terms of protein sources for you based on the diets that come back from the report, you still have the usual suspects in here. I mean, one of the things that I would do as your coach is look much more towards things like cod, haddock, mackerel. I think if you work well with lean meat in terms of ham, chicken, turkey, and you know your body in relation to those foods and that’s worked well for you, that would be fine. James: But most importantly Jonny, where do we stand on bacon? I’m serious here. Jonny: Bacon’s actually, in all seriousness, bacon made the cup for you. James: Yeah. [laughs] Good. Whew! I still don’t know where we’re at with the coffee but it’s all good. I’m very, very happy so far. Jonny: And I know that this can get very detailed. This is a really good point to mention that we’re totally not about restricting you. James: No, I know that. This is what I’m hearing – I’m hearing that I can still make my favorite pasta. I just don’t have it for breakfast, lunch and dinner. It’s like; it’ll be a good lunch to have if I’m having a high intensity energy burn day if I do the point break here. It’s like an epic surf safari. I can see it’s right around from Shelly beach at Manly. I’m not sure. You might have been here, but I basically walk around. It takes 15 minutes, 20 minutes to walk around the boardwalk with my board. Then I paddle across a deep channel out to the point break, which is a rocky outcrop where the best waves come, and then I surf for a while, and then I reverse the trip. I paddle back across the deep water, then I walk back around. It’s like minimum two and half, three-hour round trip. But if I’m having that kind of a day, then it sounds like I can go for my life, have a nice pasta and maybe put some cheese on top. Jonny: It’s so interesting you started to talk about your routine and what that looks like because you’re absolutely doing a lot of output. When we look at building out your nutrition plan, we make sure that we take into consideration what people’s lifestyles are currently like. That’s why I asked you, going into this you know, were you kind of moderately active on a scale of one to 10, or were you very, very active? James: Yes. I’m averaging 5,000 steps a day, and I’m surfing every day, and now I go to the gym three days a week. Mostly because I enjoy hanging out with Ted. But of course, the exercise part is there as well. My basic understanding before I came into this with you is that you’ve just got to balance your input and your output and that some inputs are not equal. Just basic stuff like what level of human interference has been involved? Are my portion sizes out of control for the amount of exercise I do? You only have to be on a treadmill or something. I could walk on a treadmill for a while, and it says, oh congratulations. You burned 30 calories. And I know for a fact that if you eat even a big salad and ham roll, it’s probably over a thousand or whatever. I’m not going to get into calories and kilojoules and all that because I don’t know anything about it. But the point is, I think most people underestimate how much they’re bringing in and overestimate how much they’re putting out. Jonny: Oh totally. One of the markers we do with clients is ask them honestly, pretty much, on a scale of one to 10, be honest with us, what is your current lifestyle? That’s how we start to work out optimized diets based on this information. So taking the DNA information from your report is one part of it, but then actually starting to build out, what is your activity like during the day? When do you feel low levels of energy throughout the day? And we start getting much deeper into what that looks like across the days so that we can start to build strategies for you in place to be able to combat those. So if we know that you’ve got a big surf coming up, let’s actually stock up your glycogen storage two hours before. And we know now, don’t want to give the kind of punchline away here, but gluten is an issue for you. So we don’t want to be going too, too heavy on those breads and pastas. And if we are, maybe we could reach for quinoa instead and find sources of carbohydrates that work best for you. James: Hang on a second, Anita said quinoa hooks onto your intestines and it’s bad for me. What do you think about that? Jonny: Yeah absolutely, and I would agree with her on that. I mean I think most of these things, what we’re looking at here is, we set categories for individuals to be able to go right. This is what’s come back from your report in terms of options. How have we felt with certain different foods in the past? What does it look like for you? Has it worked? But yes, there is some truth in that. I mean, one of the things that we always look for is working for what people has worked for them previously and then combining this information on top to be able to be much, much, more strategic with it. But yeah, there is some truth in that. James: And Jonny, while we’re talking about intestines, and seriously, I mean, do we look at things like what kind of poop we’re having? Like density, and color, and things, because I believe that’s probably another marker as to what’s going in with you processing a food, right? Jonny: Yeah absolutely. I mean, the next, it’s called biomarkers. James: That’s a polite way of talking about it. Of course, I should have said that. [laughs] I’m sure there’s a very good way of saying it, and I have no doubt my podcast editor will have taken that snippet and put it at the very front of this show because if you’ve got the opportunity to put poo into a dialogue, then why wouldn’t you use it, right? Jonny: Absolutely mate. It’s one of the subjects that come up the most, biomarkers. [laughs] It’s one of those things where when you’re considering DNA testing, when you do something that’s not invasive, i.e. you do a mouth swab rather than drawing blood, or taking blood work, or taking a stool sample, this allows us to start going right, we’ve done your DNA test, we’ve taken you out of the realm of the one-size-fits-all. That’s a really good question actually James. We then put biomarkers in place. The quarterly marks at 90 days, or the six, or 12-month mark to see how the strategy is performing. You’ll only ever get conclusive evidence by doing things like blood work. But this allows people to be able to go, right, I’m going to start off with this strategy that moves me into a much more defined bespoke nature for myself and then I can start to set biomarkers out. Some of the biomarkers that I do with my clients are quite forward thinking from respective things like DEXA scanning, which I know you said you went under MRI before for areas with your osteophytes on your back. DEXA scanning for me is great for people with early signs of osteopenia before osteoarthritis and also looks at lean muscle mass and bone density separation. Without going too far off topic, if I can set biomarkers with this, and I know someone comes back on the report with a gene in particular for vitamin D, which we’ll come on to talk about where we look at one gene on particular on there called VDR. VDR is in relation to how well you absorb vitamin D in relation to bone health and calcium. So many clients that I’ve had that have come through when we’ve done their genetics upstream, even if they don’t particularly look slight in frame in terms of how “fragile” they look, that VDR gene expression normally comes back with an inefficiency and when we do their DEXA scans, you can see that they’ve got already signs of osteoarthritis through osteopenia and in some cases are already developing osteoarthritis. It’s really something that, as a good example of a biomarker, which a personal trainer can put in alongside this technology to see how this strategy is performing. I’ve got to be completely honest with you; I’m not an expert in poo samples. My brother’s a doctor, and if you go back onto my episodes with him, we deep dive DNA, but it’s actually a good point. I might get him on the show to talk about biomarkers. James: Yeah. You should definitely do a poo deep dive because that would get you lots of eyeballs and ears. That’s something we can see as we go that it does have an impact. When I started eating cleaner food, I felt really gassy for the first few days. My body was just re-calibrating. One of the foods, my favorite food, and a big shout-out to Dave, is Dave’s superfood. He mixes all these really nice things. That stuff, when I first took it, I felt really gassy. And then my body settled down. And then when I ate something less clean, my body was saying, what are you doing? I don’t like this at all. Stop it. It could tell the difference. Jonny: Yes, absolutely. It’s probably like most of your business owners when they’re coming in as new members to your community that there’s so ingrained old habits. I know that I’ve been ingrained to some habits that I want to get rid off, and actually coming in too from a business perspective, you’re open and exposed to new things and new ideas just like putting new foods in your mouth, and it takes time to adjust to those and assimilate to those. James: And when they go somewhere else, it’s like a bad experience. A classic example, people have been coming to my events for years and years, and we’re having the 12th big event that we’ve ever had in March, which I think you’re coming to. When people go to them, they’re getting really good, high-quality content, actionable, well-curated, it’s a great atmosphere and experience. And then they go to someone else’s event and they’re very disappointed. It’s like a pitch fest, and no content, and all sales, just a nasty vibe, and they resent sitting there for eight hours. We’ve ruined the experience for them, basically. By changing the game, like I can’t unsee this information you’re sharing with me now. Once I’m aware of me, it just changes my outlook for the rest of my life, which hopefully is a long and happy, healthy one. Jonny: Absolutely, James. And as I said, me and my team don’t have all the answers yet. We’re using the available technology that we have at the moment, and if you look at real innovators within the space of business, then I’m sure that your community have heard of individuals like Peter Diamandis. He’s a big one for me in terms of driving my passion for this. Some of the things that they’re doing in the realm is wonderful. But actually on the ground, in the “real world” at the moment, we have to use what we have available. I think it’s just a big disservice if we don’t embrace this and at least have individuals just trying this, just going, do you know what, I’ve tried everything before, let’s just try something that has actually evolved around me and some form of vigorous science. You can probably tell how passionate I’m about it. James: I get the sense you could talk about this for the next 10 years. I also, I saw Peter Diamandis speak live. I met him in Las Vegas. He was very inspirational. He’s a big thinker. That’s the main thing I came away with. We’re just shooting so low. That being said, we should probably talk about the optimal diet type for me and have a look at some of the other markers while we’re here. Jonny: Yes. So the next marker on here is detoxification. And this term has been picked up in the form of detox diets, which become very popular every January. So people try to repair the excess of the festive period, most people have been there. And these diets, whilst largely harmless, actually don’t contribute at all to good health. They’re examples, in most cases, of fad dieting with not much evidence behind them. I’m sure there’ll be one or two listeners that could kind of counter that, but generally, from a medical point of view, when we’re looking at the removal of toxic substances from the body, we’re actually looking at primary function of detoxification by the liver. Now at the risk of oversimplifying these pathways within the liver, phase one converts the toxic substance to a less toxic substance. And phase two is the process by which the body is able to excrete that less toxic substance. So typically, toxins are found through what people ingest within the body are found it something called HCAs and PAHs, which are found primarily in carcigenics. So things like grilled meat, when you find that if you have a barbecue, you’ll know about those well in Australia. James: Yup. 75 percent of the water in America according to Dave Asprey. James: Got carcinogens in them. That’s pretty frightening. Jonny: Very, very frightening. Really good knowledge there as well. And in other areas, we’re going to come onto caffeine, alcohol, pesticides and herbicides found in food. James: One of my friends, Clint Paddison, who had a remarkable recovery from rheumatoid arthritis, mostly attributes to bikram yoga and significant change in food. He was telling me, when people do these juicing fads or whatever, they’re sticking so much sugar in it. He said we’re not lacking nutrients from most of our diet. He said our body is incredibly good at processing all the bad stuff out. He said there’s probably not much difference between a sugar-laden juice and a bottle of Coke at the end of the day. They’re just completely wasting, they’re missing the mark altogether if they’re going to stick all these sugary fruits back into their juices. Jonny: Yeah. I mean I would hazard a guess that that would be a correct assumption. I really like looking at this from a medical stance in terms of what our liver is doing. I think that would sound like a good assumption from the sugar perspective. We look in particular from the reports at two genes and these are GSTM1 and GSTT1, which deal with these nasty carcigenics in that phase two of the detoxification. Now, it’s worth noting that about 50 percent of people have this deleted form of the first one, which is GSTM1, and about 20 percent of people have the deleted form of the second one, which is GSTT1. In short, they simply don’t produce the enzyme that deals with these toxins. And those individuals have substantially reduced capacity to deal with these toxins overall in the liver. James: So these free radicals? Like going around the body, mopping up all the bad stuff? Jonny: Yeah. And that’s actually in relation to what we were speaking about with the antioxidant markers in relation to oxidative stress. With this, what we’re looking more granular at the liver itself. One of the things that we’ll come onto and find out with people that may feel like this is actually quite bad news that they don’t have this enzyme that’s produced or even running very efficiently is that there’s a actually a really neat dietary hack that people can do in mitigating the loss of these genes. And that’s actually to consume cruciferous vegetables. Cruciferous vegetables include things like cabbage, broccoli, kale, the forbidden Brussel sprouts for anyone that’s got children at dinner time, and also, cauliflower. What these cruciferous vegetables contain is a whole host of healthful substances, one of which is called isothiocyanates, which helps in this second phase, phase two, we’re talking about excreting these toxins out of the liver. Now from your results, you actually have the deleted version of GSTM1, which means that no GSTM1 enzyme is actually produced. I would strongly recommend from looking at this protocol that we would make sure that you increase your portions of extra cruciferous vegetables and probably, if it was me that was coaching you, I would consume on average at least three to four portions a week minimum, in terms of making sure that you’re getting these in your diet. James: Well good news, I’m eating vegetables every day down at Dave’s. Jonny: Wonderful. I mean from a fiber perspective in terms of actually, we’ve already spoken about poo. James: Just to let you know, my poo is fantastic. I’m pretty sure it’s because I’m having vegetables every day. My friend Betty Rocker, she said make sure most of your plate is vegetables. That pretty much fixes most people’s problems if they would just have more servings of vegetables. Jonny: Yes, and I really like Betty Rocker. I’ve been watching her progress. So big shout-out to her. James: Some green stuff, some colored stuff, and you’re all good. Jonny: Yeah. One layer back from that, the interesting thing is that we now know that the genes play a role in supporting your detoxification pathways along with everyone else. That’s really important controlling disease. Now interestingly, the next time that you’re actually in the supermarket and you pick up a broccoli, you know that you actually don’t produce that GSTM1 enzyme and actually need that. James: Can I take a supplement? Jonny: I beg your pardon? James: Can I take a supplement? I’ve got this greens powder that’s supposed to be like 11 or 12 servings of vegetables in one go where I’d mix it with water. Jonny: As you said, as long as the manufacturing of that has been processed in the correct way, I wouldn’t see a problem with that. Not that I know, but normally James, in terms of recommendations with this, reaching for whole foods, which are fiber, which as you said are really going to help your digestional tracts are going to be something that I would favor. But I think it’s a really nice hack for people because not only can they have a solution for it but you now know that when the kids are on the table, some of those children are going to have to have Brussel sprouts in relation to that marker because they just don’t produce that enzyme. James: Yeah. Well that’s good. Is there a supplement? Like can you just take the anti-oxidant supplements? Jonny: Yeah. I mean in terms of the antioxidant requirements; we’ll come onto that next actually and actually have a look at your sensitivity to that because you’ve second guessed it here. It’s actually a raised sensitivity. And we spoke about in the first part of your report, with the fitness reports, we gave the analogy of the rusting of the boat, where both you and I went out to sea in the Atlantic and we had rusting in the boat and one of us looked after our boats and one didn’t. The same is true when we work out and our bodies actually start to break down, which is a good thing because we’re in that process of actually putting on new lean muscle mass through those micro tears in the muscle and actually building nice quality lean muscle mass. The downside to that so to speak is we have breakups in the body, which need to be dealt with, and they’re known as oxidative ions. And what we need is antioxidants to go and grab those and flush them out of our system before they start taking over the place. So when we look at antioxidant need from a nutritional point of view, it really is a significant marker, and it impacts how well you can recover, which we spoke about before in between sessions. Here on the panel, we look at three genes – SOD2, CAT and GPX1. Now what SOD2 does is it converts free radicals, which can damage muscle cells into hydrogen peroxide, which for most people, most listeners, sounds like bad news. And hydrogen peroxide is part of the process, it’s still toxic, and it can cause damage to the muscle in an ongoing process. That’s where the CAT and GPX1 step in, and they actually help to break down hydrogen peroxide into a non-toxic substance. 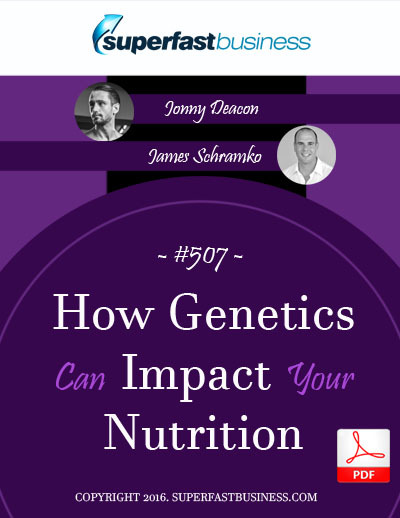 So knowing which versions of these genes you have James is important because it will allow you small changes to your diet to happen in order to enhance your recovery. The one thing I would say to you is in terms of the actual amounts of these you need, at the end of your reports, when people get their reports, there’s actually a very neat, easy to understand, recommended, daily allowance column against micronutrients, vitamins, and then the recommended against your genes. And we’ll come on to talk about how that relates to you at the end of this section of the report for sure. James: Cool. Well, I’m dying to know. Jonny: Absolutely. So the next marker on here is omega-3 requirement, and you actually again have a raised need for this. Now, what are omega-3 fatty acids and why are they good for our health? So omega-3 fatty acids are a type of unsaturated fat, and they’re often referred to as essential fatty acids because our bodies need them to function normally. Now we don’t naturally manufacture these within our bodies. So it’s really important we take in enough omega-3’s as part of our diet. Now there’s many health benefits associated with omega-3 fatty acids including amongst others, lowering blood fats and helping reduce rheumatoid arthritis. And they also have an effect on an anti-inflammatory effect. Now, we test for two genes, and they can influence your body’s inflammation levels. And from these results, we can make recommendations about your individual need for dietary omega-3’s. So they either come back as a high natural inflammatory response and you’re advised to increase your alliance of omega-3 rich foods, combat this raised information. And we know that from your genes, in particular, the one we’re concerned here is the TNF gene that you actually need the maximum amount of omega-3, which the recommendation here is three grams of omega-3 a day, which is a significant amount. As you already said, you can take that in the form of a supplementation or you can get that from foods, which we’ve spoken about from your fat source list, which include things like salmon and even flaxseed and any other fish source that you really enjoy. James: Well, I’m all over this one. I tested this. After I had my MRI, one doctor said, “Listen, there’s no scientific double blind tested result that shows any of this stuff is effective whatsoever.” The other one said, “You could probably take some fish oil.” And then I have friends who are in the market with krill oil, which is like a high concentrated type of fish oil, I think. I’ve been testing it. I take the 1500 dosage one, and I take fish oil in the morning, and I take it in the evening, and it makes a significant difference. I’ll tell you how much of an impact it makes. I feel like the Tin Man from the Wizard of Oz. I can like, crack and crick when I wake up. And I take this, and I feel like it’s oiling my joints. Jonny: That’s exactly, in a very plain bottom line approach, that’s exactly what it does. James: If I don’t take it, my body will start screaming in pain. I believe it makes a significant difference to my pain management and my ability to move. So there’s no question about fish oil for me. I’ve got there by myself; however, this report, it’s almost a relief. It’s like, ahh, well finally, I now don’t feel like it’s a placebo effect, if you know what I mean. Jonny: Absolutely. And again, I say this to my brother all the time when I have discussions with them about this, I’m not a doctor. When we talk about all of this, what we’re trying to do is move you to the realm where you’re going to have discussions with qualified doctors and say, “Look, I’ve actually done a DNA test with my coach, my personal trainer, and we flagged up some issues that I really want to have a deeper look at here. Can we do some biomarkers? Can I ask some questions about this with you in more detail?” I think that’s where we start to get real power from this. It’s not the be-all and end-all, but we can start to give you a stronger voice when you want to talk in confidence, when you want to talk about these issues with your GP or whoever you’re seeing in relation to your health. It brings us neatly on to something, which I know we’ve spoken about off air, which is vitamin B. This is a very interesting vitamin because it gets quite a lot of press amongst people in relation to a few things that go on within the body. You’ve actually come back with a raised requirement of vitamin B. Now, whilst we know that the guideline daily allowances are sufficient for most people, we now know that small differences in our genes can increase the risk of certain health issues. In most cases, this can be easily corrected by consuming a little bit more of certain nutrients. An example of this, across B9, B6, B12. The problem is people go for months, years, and even decades not knowing if they have a raised requirement. And this can be particularly damaging in relation to vitamin B, because when determining the vitamin B requirement for each person, what we look at is a gene called MTHFR gene, which is known at particular site called C677T. Now MTHFR gene is otherwise known as the mother fracker gene. It actually curates an enzyme called methylenetetrahydrofolate reductase, which plays a role in a complex series of reactions called methylation. Now what we know is that different people have different genotypes of this MTHFR gene, which can make this enzyme work slightly less well. Now in people with the CC genotype, this enzyme works really well. And it’s not associated with any disease. However, people with TT genotype, the enzyme activity is much reduced, working in and around somewhere between 30 and 35 percent as well as people with the CC genotype. And the CT genotypes’ activities are around 75 percent that of the CC genotype. So if you have the CC version, you’re OK. It’s working properly. And if you have the CT version, it’s at 75 percent, and then finding if you are a TT genotype, it’s at that 35 percent, which is significantly low. And your results came back in intermediate. You’re actually CT at 75 percent. So the recommendations we would give is to have more folic acid, which is derivative of B9. This is extremely important for you, because the one thing this enzyme does is it converts something called homocysteine into methylamine. Now elevated levels of homocysteine are associated with an increased risk of cardiovascular disease, hypertension, even stroke. If the ability to convert homocysteine to methylamine is reduced because of these differences in the MTHFR gene, then homocysteine can accumulate within the blood, and it can increase the risk of those diseases. And I know this sounds scary, but it actually turns out that by making some small, simple dietary changes, you can actually null this – are you getting more folic acid, more folate into your system to be able to deal with that enzyme if you are running a 35 percent, or in your case, a 75 percent? So it turns out that vitamin B9 is really effective at reducing homocysteine, especially in that MTHFR CT and TT genotypes. Now you may have heard of vitamin B9 before as folate or folic acid, which we briefly touched on, because it tends to be found in green, leafy vegetables, and in some countries, it’s added to food as fortification already. The problem is, B9 needs to be made into a bioactive form, i.e. broken down into a usable form for the body to actually lower homocysteine levels. And this is controlled by the MTHFR gene. So if you’re only working at 35 percent, which you just miss out on, you need much, much more vitamin B to adequately meet optimal health. So this is where we start to question the recommended daily allowances, and I’m not sure what they are in Australia, James, but certainly for the UK and Europe, which is based on this report, when we’re working with US and Australian clients, we always say, “Look, just go in and dig in, and take a look at what your RDAs are. They’re probably going to be similar to the EU recommended daily allowances. And if we know that we’re hovering in and around having that recommended daily allowance for B6 and B9, you might need more than what that is against the EU recommended daily allowances. James: OK. So this is where we get serious. When I did the first DNA report, and I then plugged it into a methylation report, it said, “Hey, you’re either missing or it’s not effective, the gene that processes this B12 and folate.” I went and bought B12 and folate tablets. Is that effective or not effective? Jonny: It is, yeah. If it’s in a bio form, which means that it’s ready to be able to be utilized by the body in that cycle. So the problem comes when people which are operating at that 35 percent, even if they get that bio form and it’s ready to go, they’re not taking the adequate amount. So those methylation cycles never actually get working properly and firing up. So that’s where we cause these levels of homocysteine levels to really increase within the body and represented within the blood. James: Right. So is that a yes or a no? Because I don’t know how to interpret that. Jonny: Yes. So did you have problems with the B9? Were there issues with it? James: I’m not sure what you mean, the report or when I take the supplement? Jonny: Yes. So you purchased the supplement, did you? James: Yeah. Bought B12, and I bought folate, because it said I can’t process that. So I figured I must take it as a supplement. This is where it’s vitally important, obviously, to get someone to interpret the reports for you. I didn’t take any supplements six months ago. So now, I take fish oil, krill oil, glucosamine, B12, and folate each day. I feel fantastic. No question about that. Things like MCT oil and unsalted butter and coffee, things like that, I can really get a charge from things like that. And obviously, I’m eating cleaner and greener and I’ve cut back on my pastas, and I’m having some protein powder mixed in water for a meal occasionally. I’m feeling great. But yeah, I haven’t noticed, I can’t say I’ve really noticed any difference, but I do feel good, but it doesn’t feel bad, if that’s what you’re asking. Jonny: Sure. So to answer your question, B vitamins are the most commonly purchased supplements. So when you went out and bought those, they can include B2, B6. James: Well they’re specifically B12 and folate. I specifically got the ones that said on my report I can’t process. Jonny: Yes. So B9, otherwise known as folate, that really is like, almost like the Ferrari of this methylation process. So what we mean by that is without folate, no cells in the body can divide. To give you an example, studies show that the presence of folate reduces our risk of Alzheimer disease, heart disease, various different fuelings within the mitochondria and supporting our immune system. James: How do I tell that? That’s what I’m asking. How do I know if it’s active? Jonny: It should say on the back of the supplement. James: Wait there, I’m getting the supplement. James: OK. Not doctor Jonny Deacon, this vitamin B12 doesn’t really have anything. The folate optimizes folic acid levels. So it’s folic acid 500 whatever. It’s got a picture of a pregnant lady on the front. It’s like buying tampons at the chemist for someone else. You think, hmm, this is an embarrassing purchase. But it says, convenient dose of folic acid developed for women during, planning pregnancy who may not get adequate levels of folic acid in their diet. It may take approximately 12 cups of cooked green beans daily to obtain equivalent of 500 whatever, micrograms of folic acid through diet alone. Jonny: In most cases, with good forms of folic acid, it actually comes in its bio form. James: So you think it’s probably OK? And it’s probably helping me. Jonny: Yeah absolutely. The thing with all of this is without actually making the recommendation ourselves, via what I would give you, I can’t comment too far on it, but in terms of relation to what you’re looking for, you’re absolutely looking for, especially with that 75 percent, you’re not at the end of where it’s at, not working with the 35 percent range where you need a lot more. James: So if it gets down to it, do I just keep buying and taking this tablet or would you recommend something else? Jonny: I would recommend continuing with B9. We’d need to see what the details are with that product individually. I would make a suggestion that sticking to the current RDAs, which they say here for B9 is in around 400 micrograms per day, I would suggest at the moment sticking to that and then we could look at increasing it based on that 75 percent that came back from your g markers, but with all of this, we need to make sure that if you were to come back, if a listener were to come back at that 35 percent range, the key takeaway from this is that the recommended daily allowances are just not sufficient enough, and people would go unaware without that. So it will be interesting over the next couple of weeks and months to be able to put a protocol in place that starts with your goals based on your genes, and then work from there. James: Right. So basically, I’m just a simple guy trying to break it down here. So with the diet that you’re talking about and the supplements I’m taking, I’ve got it fairly close to tuned. James: Someone said to me last night, “He really teases you with those report results, doesn’t he?” I’m like, “Yes, he does.” It’s a game, isn’t’ it? It’s a game you’re playing with me. Let’s string this report out as long as possible. I know we’ve still got other vitamins and things to talk about. Jonny: Not at all. I’m just very, very conscious to not give out advice. James: Yeah, you’re not giving advice. We’re just having a chat about my report in a non-medical way. It’s interesting to me because it’s my report. I’m just hoping, a listener might be thinking, I’d like to get my own report because this sounds interesting. That’s where this is going. I’m saying the outcome of you doing this report and explaining it to me is that my life will be different than what it was before, and that’s the whole point of this podcast. Jonny: Absolutely. Yeah, without question. James: So we’ve talked about omega, we’ve talked about vitamin B. Oh I forgot to mention, I also am taking vitamin D.
Jonny: Yeah and that’s actually, you’re beating me to the punchline on all of this. Our next marker on here is vitamin D. Vitamin D up until recently has had various different issues with the press. One of the things that vitamin D is well known for is in relation to deficiency in relation to bone health. So vitamin D historically is classified as, you need vitamin D to be able to make sure that you’re getting good absorption within your bone health. So that it acts as good absorption catalyst for calcium. The problem is it actually has lots of other qualities that manifest within health. So it’s needed for hormone production, metabolism, fibroid, adrenal and gut health, regulation of the immune system. Some people will have a much greater absorption rate through the gene that we look at, which is called VDR, in comparison to others. Now, there are some misconceptions with this. Depending on your gene and to not give it away too quickly, you actually came back here as normal. So you don’t have a raised need in relation to this VDR gene of vitamin D.
And actually from your results based on the RDAs, we can see here that you are given 600 iu a day of vitamin D, which is pretty much bang on the RDAs of which is recommended. The problem is, especially for people that live in hot countries, people can be walking around, believing that they’re getting 15 to 20 minutes of sun, which is from memory from research is meant to be on 40 percent exposure of skin for 15 to 20 minutes within the sun. The problem with that is some people really struggle to absorb vitamin D from the sun, and they actually need an emulsion in a liquid form to be able to actually get the adequate amounts of vitamin D they need in their system. I know there are some studies from Saudi Arabia that in the eastern province, they did some research with young males where 35 percent of that group actually were very, very vitamin D deficient, and they get over 250 hours of sun per month in Saudi Arabia in that area. So anywhere that you’re living hot where you assume that you’re getting good quality levels of vitamin D can sometimes be inadequate based on your genes, and that’s why we look at these in the report in terms of this VDR marker to see (a) are you running under par there, do you need more vitamin D to be able to actually get more absorption based on that VDR gene, and are you actually able to get adequate absorption via the sun. So that’s normally quite interesting for people to hear, because it’s a big assumption that just getting that colloquial 15 to 20 minutes is enough. James: Right. Well, I’m getting plenty of sun. Don’t worry about that. We have our own special type of sun down here in Australia. We have to visit the skin cancer clinic every year for a checkup because it’s such a big problem for us. James: I know that’s not a problem you’re experiencing right now in sunny London or wherever you are. I can tell from your videos that you’re spending plenty of time indoors. Jonny: It’s starting to become very, very cold here in London. It’s a good point to be exiting to Sydney with that. James: I remember my January visit was a little on the cool side. I mean I don’t experience cold that often, but that was like cold cold. It’s like layers and like a race to the tube to get back into the warm, polluted air. Jonny: Yeah. Ironically, from memory, you said it was at the Shoreditch Inn, which is right around the corner from where I am. James: Well I know it’s cold where you are then. Lovely pub, though. Not that I drink too much. We’re going to get to that too, right? Jonny: Yes, yes. We’ll get there eventually. Jonny: [laughs] The next markers on here are…. James: I’m renaming you. Jonny I-dont-do-the-short-version Deacon. I love it. It’s very good. If they’re listening already like to this point, they’re probably very interested in it, and we should make it detailed and interesting. It’s wonderful. Keep going. Jonny: Yeah. So the next section is food sensitivity. To kind of give this a bottom line, we look at salt, alcohol and caffeine sensitivities. Now your first marker on here was salt intake. What we’ve seen here from your results is that you have a raised sensitivity to this. Now this is in relation to that gene, which cropped up in the first section of the report, so the fitness report, which called ACE gene. Now that ACE gene in relation to this, the nutrition power, is associated with increased risk of blood pressure when sodium levels i.e. salt are high or present within the diet. So in terms of a very intermediate sensitivity which you have, you do have a raised sensitivity but it’s intermediate. We will say that we want to be heading that kind of 2.2 grams max of sodium and salt per day. The strategies that you can get around this if you do like having salt and seasoning within your diet, I generally recommend to clients they reach for posh salt, which can really lower the sodium per grams. So think Pink Himalayan, or Maldon, an equivalent within the US or Australia that you might come across rather than using table salt. So that’s the kind of first marker in relation to sensitivities. The next one is alcohol. Now, I actually don’t know whether you like to drink alcohol or not James. James: I actually, just well, I probably have three servings of alcohol a week. And that’s one beer or one cider. There’s my little sweet tooth emerging. But I actually get the low-carb cider. You’d be proud of me. And I usually have a preservative-free beer, like a Beck’s, a German beer. I do like Asahi, I must admit, because we had a lot of Japanese here going from my omega fatty acid sashimi down at the Japanese restaurant. I love that dish with some wasabi. I don’t mind a bit of something spicy. But anyway, I’m not a big drinker. I don’t binge drink. I’d probably only drink once every few days in a week. Sometimes, one beer a week. I’m really just a low..
And here’s the thing, since I did my podcast with Andre about sleep, and he told me alcohol is the number one reason people don’t sleep well, I know that to be true of me. If I have two or three beers, I’ll probably have a very disturbed sleep, and it ruins me for the next day, and it interrupts my ability to surf and concentrate. Jonny: Absolutely. And we’ll talk more about that in terms of habit formations, and it’s like, the pain of it mucking up your day, which comes ahead. But from a medical point of view, most people have common knowledge that excess alcohol is harmful to their health. What we’re saying here in response to these markers is that we have an alcohol response in relation to our genes affecting our body’s response to alcohol. One of these markers is in relation to certain versions of your genes, having a positive effect, specifically on HDL cholesterol levels. So good cholesterol levels with moderate alcohol consumption. I think it’s a little bit of tongue and cheek why they put this in the report because most people like to have balance in their life, most people like to have a drink or two, or in some cases many, and we know that there are side effects of that. But what we found here from the report based on your g markers, we can identify that people, either a slow metabolizer of alcohol, so if you’ve got an AA version of this gene, you have a fast metabolism of alcohol, and if you have that G version or one G, you’ll be a slow metabolizer of alcohol. What we’re saying is the slow metabolizers have a positive effect on cholesterol. So if you’ve ever heard of the expression, “A glass of wine a day is good for your heart,” well in some cases, people with that gene marker, they can actually have a positive effect on cholesterol by having a glass. James: Yeah, one glass of red wine. Dr. John Tickell was saying it’s OK to have a glass of red wine. James: When I make my red sauce, I put a little dash of red wine, but it probably eliminates the alcohol when you’re cooking it. And I don’t know if it retains any of the good effect. But I will have a half a glass of red wine as my one of three measures a week. That might be how I consume it with a pasta dinner because it’s the right theme, you know? If you’re going to do the red sauce pasta, you have the glass of wine. It’s very tied-in. It’s good matching. Jonny: Absolutely. I know that you’re a fan of Penfolds. James: [laughs] Well I like the metaphor of Grange. I love the metaphor, as did the lunatic. James: I can’t handle any more suspense, Jonny. I’m a bundle of nerves here. Jonny: [laughs] You don’t actually have the version of the gene which will allow you to have positive effect on alcohol. James: What does that mean? So the glass of wine a day doesn’t apply to me? Jonny: Yes. You’re the AA version of this. You’re actually a fast metabolizer. So if you’re a slow metabolizer, alcohol can at 125 mils to be specific, can have a positive effect on your cholesterol levels. James: OK. Stop there for a sec. Does that mean if I’m a fast metabolizer of alcohol, does that mean if I have one beer and then I’m driving a couple of hours later, it’s going to have been absorbed by my body much faster than some people who might still be at a high risk of drink driving? Jonny: Yeah. There are other things that play there. James: But in general. It’s saying I’m not likely to be giddy and fully affected hours later. It’s washed out of my system quickly. James: I got no challenge there. I’m a biggish guy. It’s just good to know. Like when I go out and drive, I don’t drink at all. But I know for some people, one glass, they’re like completely off their head. And other people, it’s like nothing happened at all. Jonny: The next marker on here is looking at caffeine. Now, I know you’re a huge fan of coffee. But caffeine is one of the most popular and widely used stimulant drugs in the world, mostly consumed in coffee, but also tea, soft drinks, and energy drinks like Red Bull, as well as chocolate, which some people don’t realize. Many people like to get themselves started in the morning and keep themselves going if they’re tired. Now caffeine as you all know from that episode of Andre, it tends to stay a long time in the body, having a significant effect. For example, the average half-life of caffeine, the time it takes the body to process half that dose of caffeine, taken in by say a 20-year-old male is around four to six hours. That means that if he consumes 200 mg of caffeine at midday, he’s still going to have around 100 mg in his body about five or six o’clock. In stark contrast, a female’s caffeine half-life is around eight to 12 hours. Whilst people will be mostly impervious depending on high doses of caffeine more than others depending on sensitivities, we know that a gene called CYP1A2 is responsible for 95 percent of all caffeine metabolization in the body, we also know that different people have different versions of this gene. So this means that the enzyme may work faster or slower. So if you’re fast, you can handle more total caffeine. And if you have it later in the day, you’re probably going to be alright with it in terms of that bed cycle depending on when you go to bed. But as you said, your results came in that you are a fast metabolizer with that AA, so you can pretty much follow standard guidelines of that 300 mil per day. So we normally relate that to having kind of two medium-sized Starbuck filter coffees, but again, gram per cup that can depend on where you get your coffee from, and I know that you’re a big coffee connoisseur so I’m almost certain that you’ve got some insight on it. James: Yeah. I’m grinding my own beans here that I’ve selected from the preferred suppliers. I really, really, like coffee. Even if you told me I can’t have it, I’d probably have it anyway. I’m better on coffee. Actually, I went off coffee for a year or two when I was selling cars. My boss at the time, he said, “Can you just get back on coffee? You’re so much better on coffee.” [laughs] That’s actually right. But I’m also aware, I did modify how I have it. I will have less milk or no milk in some cases. Like now, if I’m putting butter for example in it, I won’t have any milk. I know someone listening to this will think, you can’t be a coffee connoisseur and have bulletproof coffee. I agree with that comment. I’m not a coffee snob, but I just like trying it in different ways. I also stopped taking my one sugar in my coffee a few years back when I learned about how poisonous sugar is. But my default was to have a sugar in it. So I realized how much sugar is in milk, so I switched to almond milk as well and then I stopped having milk, and I don’t have sugar in it. So just some of those little changes I made. Or I have a piccolo or macchiato instead of cappuccino. That significantly reduces the amount of milk that was in there. James: Well I don’t drink Red Bull. I don’t drink Coke often at all, unless I’m putting bourbon in it, and I’m just lashing out. But that’s extremely rare. And I do eat that dark chocolate, cocoa chocolate. I like that one. It’s not very sweet though. Jonny: Yeah nice. And it’s fantastic again, that dark chocolate is fantastic as an antioxidant. You’re going to get a double whammy hit with that from report’s perspective. And it’s interesting you talked about lactose because the next marker on here is lactose tolerance. You’re actually lactose tolerant. It’s interesting with looking at lactose because some people adore dairy products, and they’ll never have any ill effect from eating them, whilst other suffer from stomach pains, loose stools; I know we’ve spoken a lot about that already within the series, diarrhea, consuming milk, yoghurt, cheese, and anything else that contains lactose. When you digest lactose into the gut, into the stomach, you produce something called lactase, which deals with lactose. So you either produce that or you don’t. In this case, you do. If you don’t, it’s not, ‘Oh my god, what’s going to happen?’ The dairy products or the lactose will move into your tract of your small and large intestines, and it will get digested there. But what happens is it ferments, so that’s what causes that suffering of stomach pains, and loose stools, and diarrhea. So inherently, what we know is, is that as babies we’ll produce this enzyme of lactase, which enables us to break down milk sugars into different components, and most mammals stop producing this once they’re weaned. But similarly, in human evolution, which we’ve spoken about, once a human reaches adulthood, that enzyme that processes lactose will be permanently turned off in most people. It actually hasn’t been with you. Now the reason for that is still unknown. It’s kind of this baffling genetic mutation, which we do know happened between 2,000 to 20,000 years ago. When we’ve spoken about it early on in this series, most people find that a very long time, but in terms of evolutionary terms, that’s like two seconds in terms of being a factor. What we also know is that interestingly, that happened in and around the region of North Turkey, South Germany, and in around that northern hemisphere region. So anyone that can actually produce lactase like you originated from that person. We believe it’s to be male from what the research is saying. So it’s quite a nice insight into knowing that very long period of time ago that you actually originated from that human. James: Wow. That’s one of the interesting things that came back from my 23andMe report was that I’m 100 percent Caucasian. Like I’m Irish, English, German, French, little bit of North European, but there was hardly any eastern, which you’d think from my surname, and I always thought growing up that I’m more Czechoslovakian or something. Not at all. I’m pretty much like you mate. I’m assuming you’re probably a fair degree of English. Jonny: Yeah. I’m actually Scottish born. James: Right. Somewhere over that region. Jonny: Yes. But for people in the UK, especially Scottish people that matters, I don’t have the accent, but I’m actually born in Glasgow. But I have a question for you. Regarding your report of finding that out, is that something that you found useful? James: Very useful, because I have four kids. I feel like I can empower them a little bit and say, “Here’s what we know about half of your bloodline.” And I was able to inform my parents, because it shows my maternal and paternal. My dad’s fascinated with the family tree and genealogy. By spitting into a jar, I was able to progress our understanding of our heritage more than he’s been able to in a decade of research. That’s how profound and powerful it was for us. He was very interested in the report and the findings. Jonny: Yes. It’s lovely, and it’s really nice to hear that there’s other tests that are being able to do certain things for certain people. And coming from a very health and fitness perspective, it’s nice to hear that there’s other attributes of this which have affected your life, it’s lovely. James: It’s like knowing who I am gives me a better sense of self. It’s like I feel more centered. It’s like, sometimes you encounter people who might have been adopted, and sometimes, they just don’t feel quite at home in life because they’re not sure where they came from, or who their parents where, or why they were passed out, or whatever. For me, having that firm root in history, my dad had already tracked down some of our heritage to French royalty and thought that was interesting. And then when the report came back and said, yeah, you’re mostly English and French, then it’s like, that ties in with what I know about the English and the French side. And now, I could dismiss my grandfather’s side, the Czech thing where I got the Schramko name from, as not being as significant as we thought because he married an Australian who was from an English background. It really diluted down. It was only like a single-digit percentage. One point something percent Eastern European. It’s not really factoring in there in a big way at all. Jonny: Yes. It’s just so fascinating, the value that your parents got from that is incredible. I’m so pleased to hear that you got value from that side of genetics testing because it’s certainly something which I don’t have as much of experience with for sure. It brings us neatly on to the last marker on your report, James, which is in relation to celiac disease in relation to your genotype. Celiac disease is a relatively common digestive condition, and it occurs when a person has an adverse effect to reaction to gluten, which is a protein found in grain such as wheat, barley, and rye. Now for those with celiac disease, eating gluten can create an immune reaction in the small intestines and it can cause a wide range of symptoms, such as what we spoke about with lactose, such as diarrhea all the way through to malnutrition with extreme cases, things like anemia. This is actually a subject that’s quite close to my heart. I actually did an episode on my podcast with my mom who’s suffered with this all her life. I actually, originally thought it was lactose, but it turned out it was the highest form of celiac disease and she struggled with it, and transformed her life now being able to manage it. In fact, around one percent of the population on average are affected by it. James: Well, according to a lot of cafes like, a huge proportion of the population think they’re gluten intolerant and they’re not at all. It’s just a complete fad, and it’s trendy. It’s like the modern day vegetarian. How do you know if there’s a vegetarian around? Don’t worry, they’ll tell you. And there’s that famous cafe that it’s happy to serve gluten-free meals as long as you bring in a doctor’s certificate. It had a social media outrage about it. Jonny: Yes. I couldn’t agree more. After speaking to my mom about it who’s had to live with it, it then leaves the rest of those individuals who really have a seriousness with it much more exposed, because the statistics show that in the UK alone, it’s one of the most underdiagnosed conditions for those that truly have it and have to bear it of up to around 13 and a half years. Now obviously as you said, we’ve come into kind of a new era of things being gluten-free trendy within the supermarkets across most of the western world. But it’s still a major problem. James: Well people are self-diagnosing I suppose. James: It’s like, they just want to fit into that. For a lot of people apparently, it’s like, it’s really not a big deal. But for the people who it is a big deal, it’s a big deal. Am I one of those people? Jonny: Yeah absolutely. What’s interesting here is that you know, living with this can cause immense amount of damage to your intestines because what happens is your small lovely villi, which absorb all of the good food that you’re eating in your intestines actually become flattened by the gluten. So this can really cause chronic malnutrition. But it doesn’t always show up. And it actually can come on based on what you’re putting on your body and in relation to your genes in terms of a genetic predisposition, which means an exposure. So you can either be a very, very low risk or you can be a very, very high risk of bringing on celiac through a poor diet choice, i.e. eating lots of wheat, barley, and rye. Now your results reveal that you’re actually, from the literature and according to the algorithm, one in 35 people with your genotype actually bring on celiac disease with an average based at around one and 100. So what this means for you based on the algorithm and the results, you actually came back a very high risk of celiac predisposition. It’s not to say that you have it right now, but what it’s saying is, from looking at it from a coach’s perspective, I would start to look at reducing areas of gluten within your diet. It doesn’t mean you need to go 100 percent gluten-free. I know that with some of the clients that we worked with, we do do that because we speak to them about what they want their lifestyle to look like, and we give them feedback on that. But this is one marker, which can absolutely have an effect later on in life, and we want to be able to put measures in place where you can actually have actionable strategies now to be able to deal with that. So it’s not something to worry about, but it’s great that we have a blueprint for you that there’s a risk here for you. James: Right. So if there’s a choice of gluten-free, you’re suggesting I probably would take that. Jonny: With clients that we work with, we do, yes. So I’ll give you an example. If you like oats, we would go for gluten-free oatmeal. If you like bread, we would limit that and then mix that in with gluten-free bread in relation to also things like pasta. James: Well basically, I reckon that only 3 million Americans can’t process the gluten properly or should avoid it, but 30 to 41 percent of Americans will take a gluten-free option. In other words, 86 percent of people who believe they’re sensitive to gluten can actually tolerate it without negative health consequences. It’s a hyped-up fad. James: Yeah. It’s because of wheat bashing from gluten-free evangelists, and it’s just been overhyped. But in my case, the markers are saying, there’s something in it for you probably. Jonny: But you know what James, that’s exactly what it’s saying. And as someone that would want to make sure if you’re under my duty of care as your trainer, I would want you to know about that and then we can make informed adult decisions about it. But I think based on experience working with clients with this, when you start to go down the old route of kind of taking things out, removing it, trial and error, what we’re trying to say here is if you’re doing kind of food removal and keeping a diary of that, it can be very time consuming and take huge amounts of effort, both for the actual trainer, building those programs and removing food week by week, and also the client has to do it. So in knowing this, it really starts to get much more strategic. But very, very interesting what you said about that statistic about the Americans. I didn’t realize that. James: Yeah. I’ve sent you a link to it, because I keep tabs on these things. I’m really fascinated with the topic. Again, to see the stats, like when you’re in the supermarket and you see there’s a gluten-free option or not a gluten-free option, the old me, I might be one of those 30 or 40 percent of people who think, gosh, a lot of people are talking about gluten. Maybe I’ll just take that one. Here’s the thing, I think I can tell when I’m eating things that my body doesn’t absolutely love. If I eat toast or something, my body is going to start to sort of let me know. I start sneezing. It could be preservatives, it could be the… I’m not sure what causes it, but I pay attention to that. If I don’t have toast, if I just cook bacon and eggs without the sandwich part, thanks very much Earl of Sandwich, then obviously I’m going for more of that fat and protein and less of the carbs. But my body doesn’t react to that. It feels happy. Same when I eat pasta. I can start sneezing, and it’s probably something to do with this. Jonny: Yeah, I mean the severity of celiac disease goes all the way through to the very severe end of autoimmune disease. James: In one of my tests, it came back and said I might be allergic to peanuts. Did this thing have anything relating to that or is that one of the less validated markers in your findings? Jonny: We don’t have that marker on the report and as we said at the start, that will only come back if it’s been validated by what the algorithm of the test comes through from research. But I think it’s interesting when you start to build out to know what these markers are, and you’re now aware. But absolutely as things progress, it’s not to mean that certain other markers from different reports might not feature in this one. But at the moment, no it doesn’t. James: Cool. So where are we at now in terms of our findings? Jonny: So that’s actually the final marker of your reports. James: Oh my god, we got there. James: We haven’t even talked about Kolbe yet. James: What’s my micronutrient requirement? You did make a note about that, and I’m curious. Jonny: Yes. So at the very end of your reports, you’ll be given a micronutrient column, which will be your RDAs and your genetic micronutrients. Again, it’s those Recommended Daily Allowances. So the idea behind this strategy is to be able to look at areas which need requirement now in terms of being increased. And we know now from certain micronutrients that you do require certain ones of these to be increased. So we have a look at your Recommended Daily Allowances against your own actual allowances based on your DNA. I picked out a couple here, which could be relevant to you. That B6 and B12, both require an increase. So for B6, it was 1.5 milligrams for the RDAs. Your genetic test reveals that it’s actually closer to 10 milligrams per day. And then on the B12 front, it’s come in here at 2.4 micrograms per day for the RDAs, and you’ve actually come in at 15 micrograms per day. So those were the two I picked out in relation to your MTHFR and methylation cycles. And then there’s other things on here, which we spoke about in relation to Omega 3, where the RDAs are actually at 1.6 grams and you’re coming in at 3 grams per day. And similarly with that vitamin and that fiber issue we talked about in relation to the cruciferous vegetables. The Recommended Daily Allowances there are 25 grams and from your reports, we would get you up to 28. So a slight increase but significant enough for us to be able to put that protocol into place. James: Nice. So let’s wrap up this episode with some discussion around the psychology around it. And I think we can cover this more lightly because we have already discussed Kolbe quite a lot in my community. We’ve had it spoken about at my SuperFastBusiness Live event. The recording of it are inside SuperFastBusiness membership. A lot of my community have done some form of strategic coach training. Dan Sullivan introduces the idea of Kolbe. Dean Jackson, a good friend of our show here, and a regular contributor, and a friend of mine who I hang out with every year, is a big fan of Kolbe. So we’ve done a lot of this discussion. I do a Kolbe on every one of my team members and anyone I coach at a high level. So should we just talk about that for a moment? Jonny: Yeah absolutely. I mean, if your audience are already aware of what Kolbe is and how it works in relation to MO and modus operandi and identifying natural talents in that way, then it’s absolutely fine. James: Well let’s talk about the Jonny Deacon version of it and how it relates to fitness. So just by way of a quick overview, Kolbe is just an inside into our predisposition, the way that we would normally operate around things. You might give us a quick overview of the modality and conation and how it works. And of course, we can put a link to Kolbe, and people can go and get the test. I usually think it’s the Kolbe A that we do as a quick one. Bat having those four digits helps people who you work with. It helps you understand how you can relate to them, what they might be particularly good with, what they might be needing more attention with for example. It’s basically a little descriptor of how someone might operate. An actual fact, when we look at the cognitive part of the mind, we’re looking at reason. It represents all of our knowledge, things like IQ, experience, education. So cognitive parts of the mind are something that most people can get a firm grip on. Now the effective part of the mind looks at controlling things like our feelings, desires, motivations. But the conative is that like you said, instinctual part of the mind. That’s what we naturally do when we’re given a situation to strive or to attain a goal. That’s why I got so interested in this in relation to health and fitness because here’s the thing James, you can give people all of the information in the world with DNA. I’ve done this in the last four and a half years of testing this. People will still not do anything with it. So I had to dig in a little bit deeper here and start to really understand what else was going on. This really moves us into a second part of a process where actually looking at Kolbe and using Kolbe to discover this conative part of the mind, something which was created by Cathy Kolbe. I’m sure your listeners are aware of her and the incredible work she’s done with this 36-questioned assessment. We’ll look at four modes, which she’s come up with, which identify four numbers in short for people to identify where they lie within this instinctual tact. So these modes, like you said, come in four – they’re fact finder, follow through, quick starter, and implementer. So the fact finder looks at gathering and sharing information. Follow through is how you arrange and design things. Quick start is in relation to risk and uncertainty. Implementer looks at how you really use tangibles and things like working with your hands. As your audience will probably be aware, there’s no right or wrong here. Like your DNA, whatever the results are, we can start to use these to become very, very strategic in relation to your health and fitness pursuits. So really looking at optimizing your health and fitness is my belief that we really need to look at these numbers in relation to coaching of how we’re communicating effectively with our clients. Now as I said, it’s all very well having DNA as one part of this, but significantly, if we were to tap into people’s unique strength and talents, we need to discover those four numbers that Kolbe allows us to do, and it’s my belief that from experience, motivation just isn’t enough. And if we’re really going to get strategic about this, we need to get people working to their grain rather than against it. I guess another example could be working against the tide or with the tide when you’re coming in and out from your surf. If we’re going to make fitness programs as efficient and as effective as possible, then it’s my belief we really need to have people qualified with an MO within the health and fitness space. Now to go a bit more granular than that, if people are aware of their Kolbes already, I know that we can mention that we could talk about your Kolbe numbers. It was something that in kind of reaching out to you and really getting to grips with how I should deal with you, I wanted to understand your Kolbe and start to relate that into a strategy about how to communicate with you. I know that from the email correspondence that we had, I found out that you initiated with a fact finder followed up with a quick start, and Kolbe gives a very short assessment of that of being classed as a negotiator, someone that could advocate, author, invest and capitalize. One of the things I found from your numbers, if I’m OK to share this James, which are 7462. Jonny: What catched my attention with this seven fact finder and six quick starter is that I can start to now really integrate this into how not only I communicate with you but also how we actually look at your talents within a health and fitness objective. So I know with that fact finder talent that you’re definitely going to need some sufficient information to be able to understand the specifics of the fitness program. You’re going to want to clarify priorities, outline objectives, you’re probably going to want to reinstate problems or look at the opportunities within the strategy to do it in a better way for you. Just knowing that first number of that seven, which is nearly a dominant towards an eight and a nine, the best way for me to be able to present any strategy to you is going to be by starting to say these objectives in your fitness program are needed to be met because, and allow you time to be able to deal with that. Now I know that you’re an expert in Kolbe, and I know that your audience are very astute to it too. There are other elements to this across the other modes. In terms of the follow through, I would really look at providing an overview for people, which kind of dominate within this blue line. When you’re looking at follow through striving towards fitness solutions, I would really want them to be able to have a process. I’d want them to be able to see that there’s consistency, there’s a step-by-step process with checkpoints and reviews, and that they can see the full picture. I know that if we want to go in with that kind of mindset with someone who doesn’t understand the conative mind or MOs in Kolbe that from a coaching perspective, there’s just a missing piece for people, and often people can end up thinking, do you know what, I don’t know why, but this program just doesn’t suit my style, and they kind of equate it to personality clashes. But we know from the research that conation is an extremely powerful driver. Likewise, if someone’s a dominant, mainly entrepreneurs come back a really dominant green line followed by a secondary high, a red line in fact find. If your talent is a quick start, and your quick start are dominant, I just know as a client perspective that you’re going to love deadline situations. You’re going to want short, sharp, 30-day endeavors, where you go really hard, you want to win, without generalizing, setting a clock for you, and potentially saying that this might be impossible doing this transformation within your health and fitness. I know that’s going to turn that Kolbe talent on to be able to really drive getting that goal towards the health and fitness objectives. And then finally with implementers, if they’re dominant within that line, I know that it’s going to be hard to even bring them into the gym. They’re going to probably want to be outside and using their hands and want lots of demonstration in terms of being able to get the best out of them. We know with implementers from the research, from what Cathy has done, words don’t really work for them. If you go OTT with words with implementers, they’re not really going to adopt that. They’re going to think, that’s not really doing it for me. I know that incorporating Kolbe within health and fitness coaching programs is significant. I think that it’s been used incredibly well in other forms of coaching across other industries. And I absolutely feel like this revolution requires this level of detail in making sure that people have strategies that are right their instincts. So I’m not sure if that’s too much or too little on that, but that’s my feeling on it. James: I think it’s just about right. What we’re saying is, now that you’ve gone from one-size-fits-all to a specific program tailored around your DNA, it helps to understand the way you process information and how you can get the best result from it. And then there’s of course other little enhancements like in our world, when you send out a customized Wistia video program for someone, you can set up little triggers using tools like Fuzed App and your email system to see if someone watches the video and if they watch a certain percentage. You can then send them an email saying, “Well done. Here’s the next video.” Or if they don’t watch it, you can say, “We noticed you haven’t watched the video yet. Go ahead and get started now.” Those little behavioral triggers can be tuned according to someone’s likelihood of being able to progress through the program or not themselves. Jonny: Absolutely yes. That’s a really good example, without a doubt. James: Very exciting stuff, isn’t it? Jonny: I hope so. I know that it’s probably been the longest episode in the world, but I’m absolutely grateful for the opportunity to be able to share this with your listeners. I’m very, very passionate about this. James: Well, I’m very grateful for my transcriber and the amazing team who turn this into a printed version. So if you want to read this, if you prefer to read stuff, or the other episodes, remember, we always put the PDF transcription. In the last episode, in episode 505, The Optimum Strategy to Health and Fitness Series with Jonny Deacon Part 1 – Why DNA?, we actually put a DNA testing and fitness plan PDF guide, like we really gave extra value. You can go and download that. Just look for episode 505. This episode is called The Optimum Strategy to Health and Fitness Series with Jonny Deacon Part 2 – Food and Psychology. What a combination. I know this stuff is exciting for you Jonny. It’s exciting for me. Listener, if you’ve been excited by it, if you got all the way to this point, then certainly, you deserve a huge congratulations for being persistent with learning about this. If you think someone could benefit from it, if it’s flipped your dial, if it’s caused you to have a reaction or write something down or take action, I’d love to hear about it. Come and leave a comment on the show. Share the episode with a friend on social media. Give us a big shout-out. Jonny is checking the comments as well. Jonny is also inside SuperFastBusiness membership where I am every day helping coach business owners. So Jonny, it’s been such a pleasure. I’m looking forward to our next episode, where we’re going to get into some even more cool stuff. I’m looking forward to that. Jonny: I am too, James. Thank you very much. James: Right. I’ve been speaking with Jonny Deacon. You can check out Jonny Deacon at his own site, mydnacoach.com. Of course you can go and get your Kolbe, or you could do any number of different DNA tests, but you need someone to interpret it and customize it for you, and that’s what Jonny Deacon does. He’s doing this program as a favor to me. I have really enjoyed working with Jonny in going through this process myself. It’s as simple as scraping a little piece of your skin off the inside of your mouth and sticking it in a tube and sending it off, and then you can get this sort of deep analysis of who you are and how you can eat better and train better to get fantastic results. Until next time, Jonny. We’ll be off there eating well and training well. See you soon. Jonny: See you soon James. Thank you! Excellent episode following up 505 and the previous podcast with Anita Chaperon. Definitely enabling to drive mainstream awareness of the practical application of genetics diagnostics. Great series of episodes James, just one thing in regards to the folic acid and B12 you are taking, if you bought it from a store in Australia there is a 99.9% chance that you have bought the synthetic version which will be useless to you if you have the MTHFR and MTRR genes. You need to get the active methyl forms of these vitamins so look for methylfolate and methylcobalamin. Correct! I had to hunt around and I found the active versions. Thank you! Just finished this episode – it took 2 sittings ! I think this is awesome – DNA testing combined with Kolbe – you don’t get much more specific on how to coach someone physically, nutritionally, and psychologically – it can only help you achieve better results faster. One comment / question regarding gluten. You mentioned gluten in terms of Coeliac disease. However, gluten is only one of over 400 different types of similar proteins found in grass seeds (wheat, barley, rye, oats etc.). The problem is not just in the small intestine, the other major problem is these proteins cause an immune response or an inflammatory response in humans, sometimes a histamine response. Anyway it can ‘trigger’ peoples’ immune system into a reactionary state. James, you said you love pasta, be conscious of the quantity and the frequency (or find a GF alternative). The gluten (grass seeds) are not good for your joints. Jonny, is there a DNA marker which shows immune responses? Or another indicator of how your immune system responds to different foods like gluten, nuts, etc? Thanks Lawrence. I took away from the information that I should ease off the Pasta and I look for the Gluten free option where possible.